If you are looking for direct virus infected SD card data recovery solution, then you can use SD card recovery software to retrieve digital media files from virus infected or corrupted SD card. 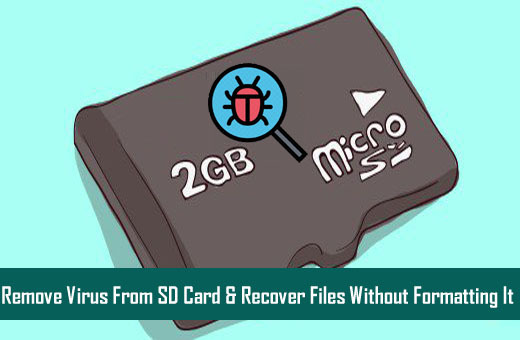 Easily get back inaccessible or corrupted photos, videos and audio files from virus attacked SD memory card. Retrieve digital media files from various memory cards such as SD card. microSD, miniSD, SDHC, SDXC, TF, CF, SmartMedia, UFS card, etc. Recover multimedia files from locked, damaged, write protected, disappeared, dead SD card and more. Also restore hidden files and recover original files created as shortcuts files due to virus infection on SD card without formatting. As we all know that SD card is small device that store large amount of data on it. SD memory card is used in electronic gadgets such as digital cameras, camcorders, mobile phones, etc. Many users store lots of their important and favorite photos, videos, movies, songs and voice recordings. But what if your SD card gets infected with virus or malware? Let us take practical scenario of users whose card gets infected with virus. When I plug my new Shaker into the computer my Avira antivirus software flags it as a Trojan. There is an application on the memory card called vhdgplfq which seems to be causing the problem. When I disconenct the Shaker, there are 2 processes still affected by the “virus”. If I try and stop the processes they just come back again and a reboot makes no difference. A full scan of the system manages to terminate these processes. What should be on the memory card (for a straight out the wrapper shaker) ? Is the vhdgplfq application required ? Can I simply replace the SD card that came with the shaker with a new “empty” one or is some sort of initialisation required ? That was just one example, similarly, there are several users out their facing such kind of problem everyday in their lives. I would like to share my experience – one day when I connect my SD card of my digital camera to PC, the card was detected by the computer, but when I attempt to access photos saved on the card, all of a sudden all images turns into shortcuts file. Next, when I checked the video files even they have also turned to shortcut files. If similar kind of problem happens to you, then do not panic! This SD card problem is not that difficult to fix. Why? As I have personally experienced the issue and was able to fix the problem (I am using a Lenovo laptop with Windows 10). Additional Reading: Tips to Recover Files from Virus Infected Flash Drive on Windows/Mac! How Virus Enters Into SD Memory Card? When you connect the card to virus infected PC/Mac or laptop. When you transfer virus infected files to the memory card or when you receive files from a device which is attacked by virus. Surfing net or malicious website while using SD card. Downloading files on your card from malicious or compromised sites. Additional Reading: How to Recover Corrupted Photos from Micro SD card on Windows/Mac? Symptoms of SD Card When It Gets Infected by Virus! You may notice the following signs when your SD card gets infected with virus whether you are using the card on digital camera, Android phones, computer or on any other devices. Your files may turn into shortcuts files. Your files may get hidden. Files get corrupted or it get removed or erased automatically without user knowledge. SD card may turn inaccessible. You will see that your SD card performance has decreased, performing any task are taking longer time. Files missing from the SD memory card. You see unexpected error message while copying files or deleting unwanted files on the SD card. You may see a prompt pop-up message asking you to format the card. SD card is detected but not accessible and you are not able to view files. You may see various SD card error messages while accessing it. Finally, let us have a look on how to get rid of virus from SD card. Connect your infected SD card to PC with the help of card reader. On your computer click Start, select Run and type cmd and hit ENTER button. A new command window will get open, now type the following command: attrib -h -r -s /s /d f:\*. * and hit ENTER. (“f:” is the drive letter name of the SD card, hence, you must type your SD card drive letter name showing on your computer). Now, Window will repair the virus infected SD card. On successful completion, you can access your files of your SD card. This worked for me. You too? Congratulations! You can now copy files from the card and paste onto safe place on your computer. And then you can format the card to re-use it again (formatting the card will erase all files on the card). After formatting the card you can copy the rescued files back onto the card. If above method fails, then you can try next solution! Scan your virus infected SD card with the help of antivirus program. (Don’t have antivirus? You can use the built-in Microsoft Security Essentials for free but is not so powerful.) You can use any reliable and reputed antivirus software and there are many option are available in the market. Scan memory card for virus thoroughly with the use of Antivirus or anti-malware program. Remove any detected virus or infected files. Now check your SD card and see if all the folders and files are normal and are accessible. If this still doesn’t work for you, then the most recommended solution for you is to take help of third-party recovery tool. In all symptoms that is mentioned above such as virus infection, creation of shortcut files or when you are not able to recover files from SD card using CMD command or antivirus fails to fix the issue, third-party recovery software works great. Photo Recovery software is one of such memory card virus remover tool that is designed to retrieve only digital media files such as image, videos and audio files from virus infected SD card, whether the SD card got infected using within Android phone, digital camera, computer, Mac or on other device. This software does not removes virus from SD card but it recover all media files without formatting and all recovered files are virus free. This recommended solution works effectively in case of accidental deletion, virus attack, formatting, corruption, damage, etc. Regularly backup important files of your SD card to some other location to deal with such situation. Do not connect your SD card with too many computers. And if you are connecting it to unfamiliar computer, then scan it with the antivirus program on that PC itself before accessing the files and folders of the card. Do not download files from compromised site on your memory card. Do not receive or transfer virus infected files from other device before checking them by scanning it through security software. Virus infection to your SD card can corrupt and make your favorite files lost or inaccessible which is not less than a nightmare. But, you can remove virus from SD card and recover media files from it without formatting by following the solutions mentioned in the post. However, if manual method fails, then you can use Photo Recovery software. Remove Virus From SD Card & Recover Files Without Formatting It. Remove Virus from SD Card using CMD command. Remove Virus from SD Card using antivirus software.